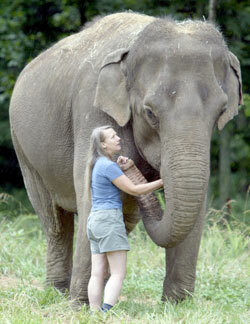 Carol Buckley through her vision and knowledge created a model for elephant, or any animal, sanctuaries in the world. She has vast knowledge and experience of elephant psychology and needs. It takes years and years of experience to get to where Carol is in her understanding and care of elephants. I have studied wild elephants for 42 years and I am immensely impressed with Carol’s ability to understand and relate to elephants. I have followed the work of Carol Buckley for a long time; in many ways, our work has paralleled each other. Carol has championed the cause of elephants and set a high standard for their care and well-being in her own country. I always wondered whether one day we might meet each other. I am so lucky that this year the Elephant Nature Park had the opportunity to welcome Carol to visit our herd. During her stay, she shared her experience and expertise with elephants and gave us much valuable advice. Carol's success in creating a wonderful natural space where her elephants can heal each other is world-renowned. Her commitment rises above personal trials; her caring, an inspiration to many. I look forward to her sharing with me many more victories on behalf of elephants. I have known Carol Buckley for over 25 years and have always found her to be an inspiration. Carol is one of the most inspired, passionate, motivated, creative visionaries I have ever known. Her brilliance is seen in her ability to become an expert in many fields in order to do what is needed for the elephants. She is a strong advocate who has captured the hearts and minds of millions of people on behalf of elephants. I am very excited to see Carol take on a broader role: I know she will have a tremendously positive impact on elephants worldwide. Carol’s authority, knowledge and competence are invaluable. She is a leading force for change in the treatment and care of elephants in the United States and beyond. Not everyone is a profound healer. Carol is. She connects to the depths of wounded elephant souls and nurtures the first tentative petal of trust to unfold. Carol rekindles the spark that nearly died under the hand of human violence. In the simple gesture of unconditional love, recovery becomes possible. Carol accomplishes something else: she transforms the human bond with elephants from weapon to salvation. Remarkably, through unfailing commitment, Carol re-instills elephant faith in life itself. I speak with some authority when I say that a very large proportion of all of the captive elephants, worldwide, suffers from abuse. Carol Buckley’s goal has been to establish truly naturalistic conditions so attuned to the biologically determined capabilities of elephants, that some healing is possible for these animals. A mere handful of people worldwide have tried to achieve such a goal and even fewer have succeeded. It should come as no surprise that in the global “community of concern” about elephant welfare, Carol Buckley is regarded as a hero. As a researcher of the behavior and ecology of wild elephants for the past 35 years, I know how vast is the gulf between the conditions that elephants find in nature and those in captivity. The challenge for the keepers of captive elephants is to understand what basic requirements must be met to avoid their animals suffering. Carol Buckley is one of the very few people who has combined the qualities of keen observation, deep compassion and practical application to achieve this understanding. If ever I want to know the answer to a question about general elephant health and well-being, physical or psychological, or about what an individual elephant would need or benefit from, Carol is the one I would go to, before anyone else. During her visit to The Surin Project, Carol Buckley’s experience and wealth of knowledge were crucial in helping us to develop the future goals and objectives for the project. Her insight has been extremely valuable in improving the welfare and management of the elephants in Surin. Carol Buckley's pioneering work on developing a care center model for elephants in captivity is worthy of emulation in different parts of the world. Her vast knowledge of elephant psychology and behaviour coupled with invaluable hands-on experience with elephants recovering from trauma, makes her a very precious and rare resource for helping elephants worldwide. Having worked with Carol for the last five years, I can attest to the fact that her experience, intuition and honesty make her the proficient proponent for Elephant Welfare.